Beautifully hand-crafted in pure New Zealand wool and cotton with an extremely intricate design pattern. The design is extremely hard to make and countless threads of various colors have been used to produce this masterpiece. - Decorate your home with this "One of a kind" handmade carpet which is only available on Rugs and Beyond. - Created with an elegant blend of fine raw hand spun pure New Zealand wool and finest quality of cotton, this rug is class apart. - This is hand knotted carpet and has a modern design pattern. - It has taken about 8-9 months to weave this beauty. - It has an intricate design pattern. 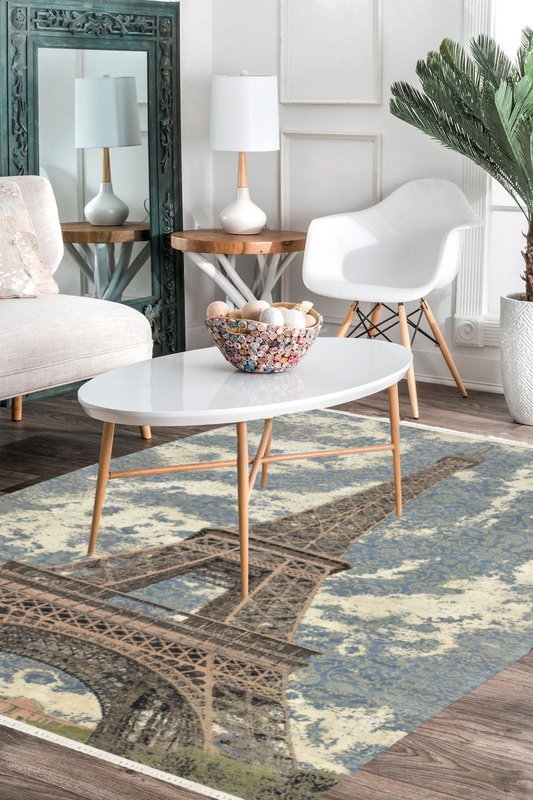 - Eiffel tower is the most exclusive handmade carpet and contains Eiffel tower design on the ground on carept. - The warp of this carpet is in finest quality of cotton(20 count by 20 ply) and weft is in pure New Zealand wool. - The design of this carpet is inspired by Eiffel tower. - It is 100% hand washable. - Weaving Technique- Hand knotted. - Dying Process- Wet Dying (vegetable dye).